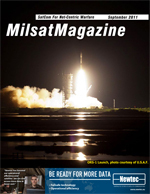 With the release of United States Coast Guard (USCG) regulations to extend Notice of Arrival/Departure (NOA/D) reporting to domestic as well as foreign vessels, captains and fleet operators have a new, onboard administrative challenge  especially if their vessel was not previously required to carry a SATCOM system with access to the Internet. Electronic notice of a vessels arrival and departure from U.S. ports, Caribbean community (CARICOM) ports, or the St. Lawrence Seaway is required at least 96 hours prior to arrival or departure, as applicable, with the electronic NOA/D (e-NOA/D) web format as the preferred method of submission. Mr. Steven Schenk serves as the Vice President and General Manager of Defense Programs for Comtech AeroAstro, Inc. In this role, Mr. Schenk is responsible for execution on all emerging defense programs. Prior to this appointment, Mr. Schenk was the Director of Advanced Concepts while concurrently functioning as Program Manager for the AFRLs Advanced Plug-and-Play Technologies Program to further develop and reduce risk for emerging Plug-and-Play technologies. Mr. Schenk additionally functioned as Program Manager of the Comtech AeroAstro ORS Multi-mission Modular Space Vehicle preliminary design phase program. He led the team that developed a flexible ORS spacecraft design that employed plug-and-play technology throughout. Mr. Schenk has over 20 years of experience in program management, engineering management, project leadership, structures/mechanisms engineering and space segment/spacecraft systems engineering in the satellite and alternative energy industries. Mr. Schenk has a proven track record in spacecraft design and development. Prior to working at Comtech AeroAstro, Mr. Schenk was the Program Manager responsible for the NASA Goddard GLAST space vehicle and DARPA Streak space vehicle programs at General Dynamics. AAMs 3D Flood Simulation of Brisbane was used extensively by Australian and global media during the flood crisis in Brisbane, Australia, earlier this year. The videos were shown on most television news channels in the hours leading up to the Brisbane flood peak and they supplied residents, business owners and the public with realistic 3D representations of the predicted flood event. The videos proved to demonstrate the primary use and benefit of 3D visualization  clear communication! Over the past five years, we have seen a dramatic shift in the military and government using more commercially available products when it comes to creating and implementing geospatial solutions. The use of commercial satellite imagery from companies such as GeoEye and DigitalGlobe, to the implementation of software solutions that aid the timely sharing and dissemination of intelligence data to the warfighter, the concept of Commercial-Off-The-Shelf (COTS) has taken on a life of its own. The result is that the military and government can be far more nimble and provide timely solutions to urgent geospatial needs. The 20th centurys industrial warfare has developed into the 21st centurys war amongst the people. Tactics and technology need to adapt as a consequence. Giles Peeters, ex-MoD and NATO satcom subject matter expert, and Defence Sector Director at Blue Force Tracking Specialists, Track24 Defence, considers the paradigm shift and the commercial implications for militaries around the world.